This statement was not uttered by some uneducated anti-technology activist, but rather was written by British physicist Dr. Gerald Hyland and was printed in the prestigious medical journal The Lancet. The deceptively simple question, much loved by television and radio interviewers, “Is it safe?” is the scientist’s banana skin. A Nobel prize awaits the person who first designs an experiment to show that anything is “safe”. In the light of experience with ionizing radiation and radioactive materials, out-of-hand dismissal of the possibility of subtle effects of low-intensity, pulsed, microwave radiation is most unwise. Early in the 20th century radon and radium-enriched spa waters were “recommended” for a wide range of aches and minor ailments. As knowledge of the harmful effects of ionizing radiation has increased and quantitative risk estimates have become possible (notwithstanding rather large error bands), the permitted annual dose limit has been progressively reduced from the 1930s to the present day. … there is evidence that the low intensity, pulsed radiation currently used can exert subtle non-thermal influences. If these influences entail adverse health consequences, current guidelines would be inadequate.This review will focus on this possibility. The radiation used is indeed of very low intensity, but an oscillatory similitude between this pulsed microwave radiation and certain electrochemical activities of the living human being should prompt concern. … there are consistencies between some of these effects and the neurological problems reported by some mobile-telephone users and people exposed longterm to base-station radiation. The Stewart Report (1), published in May, 2000, makes some sensible recommendations, but unfortunately some of its greyer areas are now being exploited by the industry to obfuscate the issue. As yet unresolved is the question of adverse health impacts provoked by the contentious non-thermal effects of the low intensity, pulsed microwave radiation (MWR) used. For these effects are not taken into account in current safety guidelines (2), which simply restrict the intensity of the radiation to prevent tissue heating in excess of what the body’s thermoregulatory mechanism can cope with … .in the case of living systems (and only living ones) there are many reports over the past 30 years that MWR can exert non-thermal influences, at intensities well below those necessary to cause any detectable heating (3). The purpose of this review is to introduce clinicians to the physics of mobile telephony and to explain how low-intensity, pulsed microwaves can affect living organisms, both thermally and non-thermally; and then to identify some of the reported biological impacts of exposure to this radiation, particularly those provoked by the contentious non-thermal effects. A base-station antenna typically radiates 60 W and a handset between 1 and 2 W (peak). The antenna of a handset radiates equally in all directions but a base-station produces a beam that is much more directional. In addition, the stations have subsidiary beams called side-lobes, into which a small fraction of the emitted power is channelled. Unlike the mean beam, these side-lobes are localized in the immediate vicinity of the mast, and, despite their low power, the power density can be comparable with that of the main beam much further away from the mast. At 150-200 m, for example, the power density in the main beam near ground level is typically tenths of a µW/cm (2). A handset that is in operation also has a low-frequency magnetic field (EMF) associated, not with the emitted microwaves, but with surges of electric current from the battery that are necessary to implement “time division multiple access” (TDMA), the system currently used to increase the number of people who can simultaneously communicate with a base-station. With handsets that have an energy-saving discontinuous transmission mode (DTX), there is an even lower frequency pulsing at 2 Hz, which occurs when the user is listening but not speaking. Heating of biological tissue is a consequence of microwave energy absorption by the tissue’s water content. The amount of heating produced in a living organism depends primarily on the intensity (or power density) of the radiation once it has penetrated the system, on certain electrical properties of the biomatter, and on the efficiency of the body’s thermoregulation mechanism. Above a certain intensity of the microwaves, temperature homoeostasis is not maintained, and effects on health ensue once the temperature rise exceeds about 1°C. Safety guidelines impose upper limits on the radiation intensity to ensure that this does not happen. Heating occurs whether the organism is alive or dead. The frequency of the radiation, as opposed to the intensity, is taken into account only in so far as it affects (via size resonance) the ability of the organism to absorb energy from the irradiating field. Amongst the most thermally vulnerable areas of the body (2), because of their low blood supply, are the eyes and the testes, and cataract formation and reduced sperm counts are well-documented acute exposure hazards. Animal studies indicate that a variety of behavioral and physiological disorders can be provoked by temperature rises below 1°C — ie, under much less acute exposure conditions … there are reports of adverse health effects of subthermal intensities, the possible origin of which will now be considered. The possibility that the pulsed, low-intensity MWR currently used in GSM mobile telephony can exert subtle, non-thermal influences on a living organism arises because microwaves are waves; they have properties other than the intensity that is regulated by safety guidelines. This microwave radiation has certain well-defined frequencies, which facilitate its discernment by a living organism (despite its ultralow intensity), and via which the organism can, in turn, be affected. The human body is an electrochemical instrument of exquisite sensitivity whose orderly functioning and control are underpinned (6) by oscillatory electrical processes of various kinds, each characterised by a specific frequency, some of which happen to be close to those used in GSM. Thus some endogenous biological electrical activities can be interfered with via oscillatory aspects of the incoming radiation, in much the same way as can the reception on a radio. Furthermore, the DTX pulse frequency at 2 Hz and the TDMA frequency of 834 Hz correspond to frequencies of electrical oscillations found in the human brain, specifically the delta and alpha brain-waves, respectively. It is thus quite possible that living organisms have a two-fold sensitivity to the pulsed GSM signal — ie, to both the microwave carrier and the lower frequency pulsings of the TDMA and DTX signals. To deny this possibility yet admit the importance of ensuring electromagnetic compatibility with electronic instruments by banning the use of mobile phones on aircraft (11) and hospitals (a prohibition driven by concerns about non-thermal interference) seems inconsistent. The intensity of radiation needed for this recognition is many orders of magnitude below even that currently associated with non-thermal effects. This influence is possible only when the organism is alive, with excited endogenous frequencies; the dead have flat electroencephalograms. Non-thermal effects thus depend on the state of the person when exposed to the radiation — ie, non-thermal effects are non-linear. A low-intensity field can entail a seemingly disproportionately large response (or none at all), and vice versa, quite unlike the predictable thermal responses. Thus not everyone can be expected to be affected in the same way by identical exposure to the same radiation. A good example of human vulnerability to a non-thermal,electromagnetic influence is the ability of a light flashing at about 15 Hz to induce seizures in people with photosensitive epilepsy (12). It is not so much the amount of energy absorbed from the light that provokes the seizure, but rather the information transmitted to the brain by the (coherent) regularity of its flashing, at a frequency that the brain “recognises” because it matches or is close to a frequency utilised by the brain itself. What do we know experimentally about non-thermal biological influences of MWR (both pulsed and continuous) of an intensity close to that near a mobile phone handset, but often at higher microwave carrier frequencies? A selection of in vitro studies is given in panel 1. In vivo evidence of non-thermal influences, including exposure to actual GSM radiation, comes predominantly from animal studies (panel 2). Finally, human in vivo studies, under GSM or similar conditions, include effects on the EEG and on blood pressure. A delayed increase in spectral power density (particularly in the alpha band) has been corroborated (31) in the “awake” EEG of adults exposed to GSM radiation. Influences on the “alseep” EEG include a shortening of rapid-eye-movement (REM) sleep during which the power density in the alpha band increases (32), and effects on non-REM sleep (33). Exposure to mobile phone radiation also decreases the preparatory slow potentials in certain regions of the brain (34) and affects memory tasks (35). In 1998, Braune et al (36) recorded increases in resting blood pressure during exposure to radiofrequencies. Non-thermal effects have proved controversial, and independent attempts to replicate them have not always been successful. 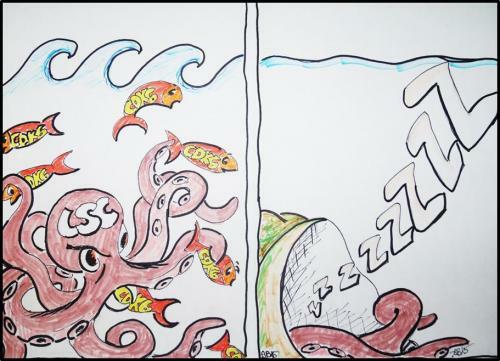 Such difficulties are not unexpected, however, because these effects depend on the state of the organism when it is exposed, particularly in vivo. … GSM radiation does seem to affect non-thermally a variety of brain functions (including the neuroendocrine system), and health problems reported anecdotally do tend to be neurological, although formal confirmation of such reports, based on epidemiological studies, is still lacking. · the permeability of the blood-brain barrier (26), both of which have been connected to headache (40,41). · on rapid-eye-movement sleep (32). Furthermore, since there is no reason to suppose that the seizure-inducing ability (12) of a flashing visible light does not extend to microwave radiation (which can access the brain through the skull) flashing at a similarly low frequency, together with the fact that exposure to pulsed MWR can induce epileptic activity in rats (24), reports of epileptic activity in some children exposed to base-station radiation are perhaps not surprising. Finally, the significant increase (by a factor of between 2 and 3) in the incidence of neuroepithelial tumours (the laterality of which correlates with cell-phone use) found in a nationwide US study (42) is consistent not only with the genotoxicity of GSM radiation, as indicated by increased DNA strand breaks (28) and formation of chromosome aberrations and micronuclei but also with its promotional effect on tumour development (43). … it cannot be denied that non-thermal effects of the MWR used in mobile telephony do have the potential to induce adverse health reactions of the kind reported, and this possibility should not be ignored even if only a small minority of people are at risk. Whether a person is affected or not could depend, for example, on the level of stress before exposure; if it is high enough, the additional contribution from MWR exposure might be sufficient to trigger an abnormality that would otherwise have remained latent. It is often argued that anecdotal reports of health problems should be dismissed. However, given the paucity of systematic epidemiological studies of this new technology, such reports are an indispensable source of information, a point acknowledged in the 1999 report of the UK parliamentary committee (44). Preadolescent children can be expected to be more vulnerable to any adverse health effects than adults because absorption of GSM microwaves is greatest (5) in an object about the size of a child’s head, because of the “head resonance” effect and the greater ease with which the radiation can penetrate the thinner skull of an infant (1). Also the multiframe repetition frequency of 834 Hz and the 2 Hz pulsing in the DTX mode of cellphones lie in the range of the alpha and delta brain-waves, respectively. In a child, alpha waves do not replace delta waves as a stable activity until the age of about 12 years. Furthermore, the immune system, whose efficacy is degraded (19,25) by this kind of radiation, is less robust in children. This makes them less able to cope with any adverse health effect that might be provoked by chronic exposure, not only to the pulsed microwave radiation but also to the the more penetrating low-frequency magnetic fields associated with the current surges from the handset battery which can reach 40 µT (peak) near the back of the case (45). Indications of the biological noxiousness of these magnetic fields (in animals) can be found in ref 25. In the context of base-station radiation, reports relating to animals are of particular value since it cannot here be claimed that the effects are psychosomatic. Of particular interest is a publication on cattle (43), recording severely reduced milk yields, emaciation, spontaneous abortions, and stillbirths. When cattle are removed to pastures well away from the mast, their condition improves, but it deteriorates once they are brought back. The adverse effects appeared only after GSM microwave antennae were installed on a tower formerly used to transmit only non-pulsed television and radio signals. Finally, in support of the reality of an adverse health impact of non-thermal influences of the kind of radiation used today in mobile telephony, we should recall that during the “cold war” the Soviet irradiation of western embassies with microwave radiation (of an intensity intermediate between that in the vicinity of a handset and a base-station), done with the express intention of inducing adverse health effects, was quite successful (47). The references to this excellent review by Dr. Hyland are given below. In a separate Lancet report, Massachusetts scientist Dr. Kenneth Rothman said his research indicated the main public health concern was motor vehicle collisions rather than any possible link to brain cancer. He notes that one study found that the risk of a car accident was 4 times greater when the driver was using the telephone or soon after a call and that heavy mobile users were involved in twice as many fatal road accidents than light users. In addition, use of ‘hands-free’ units was no less risky than holding the telephone to the ear with one hand while talking. Many people concerned with possible adverse health effects, including myself, have recommended the use of “Hands Free” units as a way to greatly reduce the microwave exposure. However, as we reported several weeks ago this may not necessarily be any safer. Now, upon further review of the safety evidence, including the results of tests conducted by the British Consumers Association and published in their magazine Which? the British government has decided to withdraw its recommendation that mobile phone users switch to handsfree units. In addition, they plan to start issuing leaflets warning buyers of the unknown, but potentially harmful impact of mobile phone usage by children, according to a report in Newsbytes.com. The warnings follow the British government’s continuing funding of tests into the effects of mobile phone radio frequency (RF) radiation on the soft tissue of the brain and head. Liam Donaldson, the UK‘s chief medical officer, said that the government’s decision to remove the health approval on handsfree kits followed a number of investigations that claim handsfree devices may even channel radiation to the users head. “We don’t have good enough science so far to say definitely one way or the other,” he said, adding that further research is being conducted urgently to provide an answer to the question. For more information regarding the safety of cell phones go to EMFacts Consultancy’s Mobile Phone Health Hazard’s page which is likely the best compilation of data on the mobile phone issue. This is the most comprehensive detailed and well referenced report on cell phone dangers I have yet to see. Cell phones are becoming increasingly popular, yet most are absolutely blinded to the damage they are doing to their brains by exposing themselves to this radiation. Even the conservative British journal The Lancet is warning that the dangers from this radiation can NOT be dismissed. My recommendation? Keep the use down to as low as possible (my use is less than five minutes per YEAR). Let’s keep those brain cells alive! 2 Anon. Guidelines for limiting exposure to time varying electric, magnetic and electromagnetic fields (up to 300 GHz). Health Phys 1998; 74: 494-522. 3 Hyland GJ. In: Scientific advisory system: mobile phones and health vol II, appendix 15: 86-91. London: Stationery Office, 1999. 5 Gandhi OP, Lazzi G, Furse CM, et al. 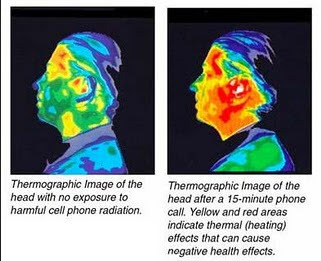 Electromagnetic absorption in the human head and neck for mobile telephones at 835 and 1900 MHz. IEEE Trans MTT 1996; 44: 1884-97. 6 Smith CW, Best S. Electromagnetic man. London: Dent & Sons, 1989. 7 FrÃ¶hlich H. The biological effects of microwaves and related questions. Adv Electronics Electron Phys 1980; 53: 85-152. 8 FrÃ¶hlich H, ed. Biological coherence and response to external stimuli. Berlin: Springer-Verlag, 1988. 9 Grundler W, Kaiser F. Experimental evidence for coherent excitations correlated with cell growth. Nanobiology 1992; 1: 163-76. 10 Hyland GJ. Non-thermal bioeffects induced by low intensity microwave irradiation of living systems. Engineering Sci Educ J 1998; 7: 261-69. 11 Marks P. Danger signals: now it’s official: avionics and mobile phones do not mix. New Scientist 2000; 166: 7. 12 Harding GFA, Jeavons PM. Photosensitive epilepsy. London: MacKeith Press, 1994. 13 Tattersall J. New Horizons 1999 (autumn): 11. 14 Shcheglov VS, Belyaev IY, Alipov YD, Ushakov VL. Power-dependent rearrangement in the spectrum of resonance effect of millimetre waves on the genome conformational state of Escherichia coli cells. Electro-Magnetobiol 1997; 16: 69-82. 15 Golant MB, Mudrick DG, Kruglyakova OP, Izvol’skaya VE, et al. Effect of EHF radiation polarization on yeast cells. Radiophys Quantum Electron 1994; 37: 82-84. 16 Lukashevsky K, Belyaev IY. Switching of prophage * genes in E coli by millimetre waves. Med Sci Res 1990; 18: 955-57. 17 Smolyanskaya AZ, Vilenskaya RL. Effects of millimetre-band electromagnetic radiation on the functional activity of certain genetic elements of bacterial cells. Sov Phys Usp (English transl) 1974; 16: 571-72. 18 Penafiel LM, Litovitz T, Krause D, Desta A, Mullins JM. Role of modulation on the effect of microwaves on ornithine decarboxylase activity in L929 cells. Bioelectromagnetics 1997; 18: 132-41. 19 Lyle B, et al. Suppression of T-lymphocyte cytotoxicity following exposure to sinusoidally amplitude-modified fields. Bioelectromagnetics 1983; 4: 281-92. 20 Savopol T, Moraru R, Dinu A, KovÃ¡cs E, Sajin G. Membrane damage of human red blood cells induced by low power microwave radiation. Electro-Magnetobiol 1995; 14: 99-105. 21 Dutta SK, Subramoniam A, Ghosh B, Parslad R. Microwave radiation-induced calcium ion efflux from human neuroblastoma cells in culture. Bioelectromagnetics 1984; 5: 71-78. 22 Garaj-Vhovac V, Fucic A, Horvat D. The correlation between the frequency of micronuclei and specific aberrations in human lymphocytes exposed to microwave radiation in vitro. Mutation Res 1992; 281: 181-86. 23 Balcer-Kubiczek EK, Harrison GH. Neoplastic transformation of C3H/10T1/2 cells following exposure to 120 Hz modulated 2.45 GHz microwaves and phorbol ester tumour promoter. Radiation Res 1991; 126: 65-72. 24 Sidorenko AV, Tsaryk VV. Electrophysiological characteristics of the epileptic activity in the rat brain upon microwave treatment. In: Proceedings of Conference on Electromagnetic Fields and Human Health (Moscow, September, 1999): 283-84. 25 Youbicier-Simo BJ, Bastide M. Pathological effects induced by embryonic and postnatal exposure to EMFs radiation by cellular mobile phones (written evidence to IEGMP). Radiat Protect 1999; 1: 218-23. 26 Persson BRR, Salford LG, Brun A, et al. Blood-brain barrier permeability in rats exposed to electromagnetic fields used in wireless communication. Wireless Networks 1997; 3: 455-61. 27 Frey AH, ed. On the nature of electromagnetic field interactions with biological systems. Austin, TX: RG Landes, 1994. 28 Lai H, Singh NP. Single and double-strand DNA breaks after acute exposure to radiofrequency radiation. Int J Radiation Biol 1996; 69: 13-521. 29 Repacholi MH, Baster A, Gebski V, Noonan D, Finnie J, Harris AW. Lymphomas in Eµ-Pim 1 transgenic mice exposed to pulsed 900 MHz electromagentic fields. Radiation Res 1997; 147: 631-40. 30 Lai H, Horita A, Chou CK, Guy AW. A review of microwave irradiation and actions of psychoactive drugs. Engineering Med Biol 1987; 6: 31-36. 31 Reiser H-P, Dimpfel W, Schober F. The influence of electromagnetic fields on human brain activity. Eur J Med Res 1995; 1: 27-32. 32 Mann K, Roschke J. Effects of pulsed high-frequency electromagnetic fields on human sleep. Neuropsychobiology 1996; 33: 41-47. 33 Borbely AA, Huber R, Graf T, et al. Pulsed high-frequency electromagnetic field affects human sleep and sleep electroencephalogram. Neurosci Lett 1999; 275: 207-10. 34 Freude G, Ullsperger P, Eggert S, Ruppe I. Effects of microwaves emitted by cellular phones on human slow brain potentials. Bioelectromagnetics 1998; 19: 384-87. 35 Krause CM, et al. Effects of electromagnetic field emitted by cellular telephones on the EEG during a memory task. NeuroReport 2000; 11: 761-64. 36 Braune S, Wrocklage C, Raczek J Gailus T, LÃ¼ching CH. Resting blood pressure increase during exposure to radio-frequency electromagnetic field. Lancet 1998; 351: 1857-58. 37 Gos P, Eicher B, Kohli J, Heyer WD. Extremely high frequency fields at low power density do not affect the division of exponential phase Saccharomyces cerevisiae cells. Bioelectromagnetics 1997; 18: 142-55. 38 Malyapa RS, Ahern EW, Bi C, et al. DNA damage in rat brain cells after in vivo exposure to 2450 MHz electromagnetic radiation and various methods of euthanasia. Radiation Res 1998; 149: 637-45. 39 Kaiser F. The role of chaos in biological systems. In: Barrett TW, Pohl HA, eds. Energy transfer dynamics. Berlin: Springer-Verlag, 1987: 224-36. 40 Winkler T, Sharma HS, Stalberg E, Olsson Y, Dey PK. Impairment of blood-brain barrier function by serotonin induces desynchronization of spontaneous cerebral cortical activity: experimental observations in the anaesthetized rat. Neuroscience 1995; 68: 1097-104. 41 Barbanti P, Bronzetti F, Ricci A, et al. Increased density of dopamine D5 receptor in peripheral blood lymphocytes of migraineurs: a marker of migraine? Neurosci Lett 1996; 207: 73-76. 42 Carlo GL. Wireless telephones and health: WTR Final Report. Presented to the French National Assembly, June 19, 2000. 44 Scientific Advisory System: mobile phones and health. London: Stationery Office 1999: vol I, para 36. 46 LÃ¶scher W, KÃ¤s G. Conspicuous behavioural abnormalities in a dairy cow herd near a TV and radio transmitting antenna. Pract Vet Surg 1998; 79: 437-44. 47 Goldsmith JR. Epidemiological evidence of radiofrequency radiation (microwave) effects on health in military, broadcasting, and occupational studies. Int J Occup Environ Health 1995; 1: 47-57.